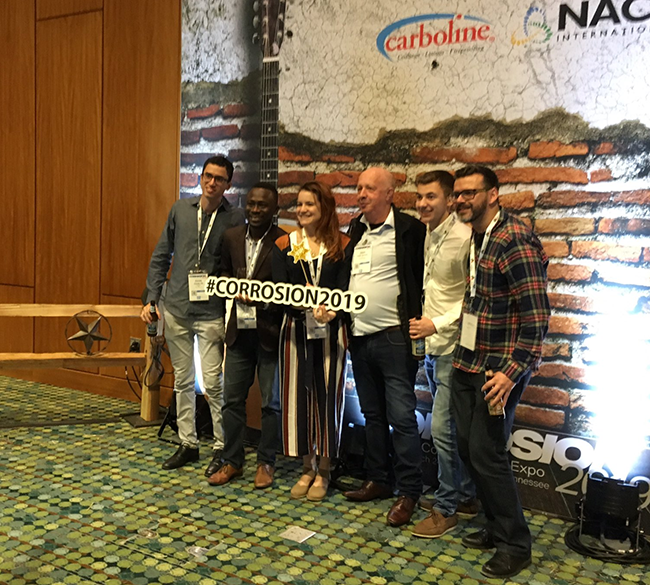 Cosponsored by Carboline and NACE International, the event kicked off with welcome speeches by NACE CEO Bob Chalker as well as Carboline’s VP of Marketing Melissa Molitor. The event offered attendees and exhibitors the chance to network over drinks and hors d’oeuvres. It also included a photo booth, complete with bales of hay and picturesque background, and a cowboy demonstrating his lassoing skills. With a one-man guitarist setting the stage, the event was a crowd pleaser and a solid way to kick off the week’s events. NACE International welcomes you to an evening of networking, refreshments, and presentation of the 2019 association awards. Association awards recognize members for their outstanding contributions to NACE, corrosion control methods, science, and engineering. NACE attendees from several countries in Latin America, as well as the United States and other countries, gathered on Tuesday afternoon to learn about NACE International section activities in Latin America, and energy markets and corrosion control methods and needs in Ecuador, Mexico, and Brazil. The American Society of Naval Engineers (ASNE) presented a panel of subject matter experts regarding corrosion and U.S. Navy Assets on Wednesday, March 27th from 3:30 p.m. to 5:00 p.m. The full name of the session was “Increasing the Availability of U.S. Navy Assets: A Corrosion Control Panel by ASNE’s MegaRust,”and it included presenters from the Space and Naval Warfare Systems Command (SPAWAR), Naval Sea Systems Command (NAVSEA), and Naval Air Systems Command (NAVAIR).